According to the Cleveland Browns, the team has traded offensive lineman Cam Erving to the Kansas City Chiefs for a fifth-round draft pick. Erving was the Browns first-round draft pick in 2015. Erving has always been viewed as a Swiss Army knife along the offensive line. In his two seasons with the Browns, he started at four of five offensive line positions. 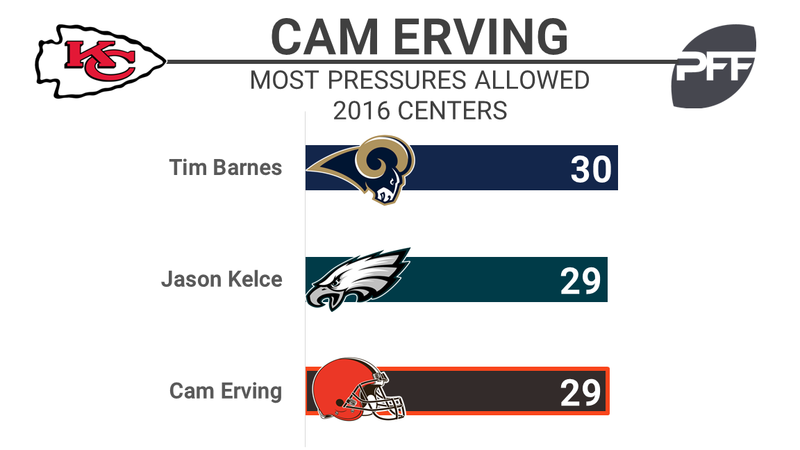 Erving started 13 games for the Browns last season — 12 at center and one at right tackle — totaling 699 offensive snaps. In 2015, he played mostly guard, starting two games at left guard and two at right guard and totaling 429 offensive snaps on the season. Erving has not yet lived up to his high draft status. In 2016, he was the lowest-ranked guard in the NFL among 38 qualifiers with an overall grade of 36.8. He struggled in both pass protection and as a run-blocker but most notably surrendered 29 total pressures on just 438 pass-block snaps, finishing with the lowest pass-blocking efficiency among centers.